Dogs can ride in strollers of their own. Dogs are babies, all right. A recent Harris Polling survey showed nine out of 10 pet parents see their furkids as family members. And the American Pet Products Association estimates pet owners will spend almost $53 million on their furry kids in 2012. This includes products like doggie baby carriages. Dog carriages or strollers are used for many reasons. For some pet parents, it allows them to take a brisk walk while their dog lounges in the fresh air. Other times, it gets an ill or elderly dog outside when he might otherwise be cooped up. In still other cases, it is for safety or comfort, when a dog's paws might be hurt by hot pavement, sharp objects on the ground or other risky environments. When choosing your dog's new ride, research the whole product including size and design. Carriages can range in price from $25 for a tiny dog, to hundreds on up. Verify product dimensions to make sure it will be roomy enough. Companies often show a picture of a dog in the stroller to clarify size. 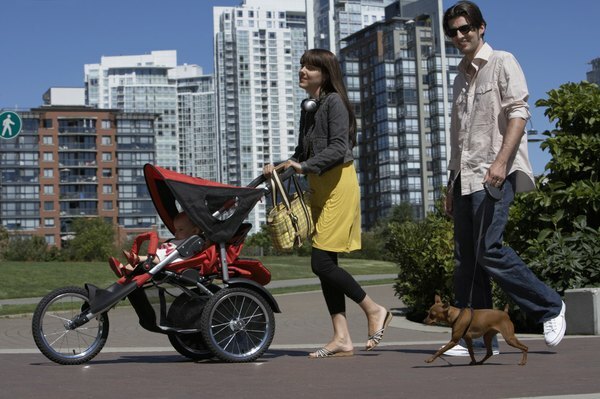 A black stroller will get hotter than a lighter-colored one. Also, it should have multiple zipper windows so your dog can get adequate air. The carriage is new in your dog's life, and he's not used to it. Depending on his personality, he may jump in ready to rumble, or cower and resist. Being in the carriage should be a positive experience. If he seems unsure, put a treat inside and offer tons of encouragement and praise. Repeat as needed. Also, each time he gets into his new "car," hold the handlebar so the carriage doesn't roll out from under him. Most dog carriages are collapsible, making for easy storage under the bed or in a closet. Check out individual cleaning instructions, but most suffice with regular wipedowns with a damp cloth. Once your dog gets used to his new vehicle, you can start enjoying regular walks together in this way. You wait for him during his slow, stop-every-five-seconds-and-sniff-everything walks -- now he can hang with you while you get some real exercise. Can Corn Litter Hurt Cats? Is Talcum Powder Poisonous to Cats?